The seemingly simple design is actually a family-sized cooker that can handle an entire meal on a sunny day. It features an insulated box with a glass or heat-resistant plastic cover that also serves as an oven door. Sunlight passes through the glass or plastic into a dark cooking area. Additional sunlight is reflected into the box cooker by a shiny lid attached to the box. When in use, supports made of cord and wood hold the reflector above the cooking area. Cardboard box cookers are light, compact, and easy to store or move. Heavier wooden models are more useful for the backyard or patio. Depending upon their construction, these cookers typically reach temperatures of 120 to 225 degrees. Many do-it yourself buffs choose the slant-faced solar cooker. These are often highly efficient cookers and very portable, folding to a size of a suitcase. To use, the slant-cooker-face is pointed toward the sun and the reflectors are secured in the open position. Some cookers feature built-in height adjusters for more direct aim at the sun. The cooker style features many small mirrors, curved in a cone-shape around the cooking area. This reflector often spans four feet in diameter and with a lid can double as a patio table. These cookers reach temperatures, of 300 to 450 degrees and cook food in the same time as a conventional cooker. The cooking area is large enough for a turkey. 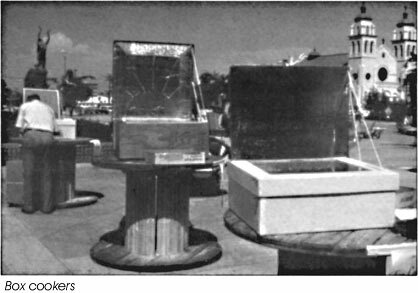 Concentrating cookers, or “hot plates,” employ dish-shaped reflectors aimed at the sky like radio receivers. The reflector is designed so that direct light bounces on to a single point. At this point, a cooking stand holds a pot of food or water. The stand can be attached to the collector or be separate. Concentrating cookers can generate temperatures of 600 degrees Fahrenheit or more and must be constantly attended as the sun moves across the sky. The reflector must be repositioned to follow the sun and keep the focal point on the food being cooked. When left unattended, concentrating cookers have been known to set wood on fire and even burn the ear of a curious dog unlucky enough to be in the wrong place at the wrong time. These cookers also have a dangerous tendency to tip in windy weather.